A good On-Piste Cruiser makes carving easy, effortless and fun. Designed to perform on packed snow, many are versatile enough to play in the softer snow and small bumps. They’re identifiable on the ski rack with their curvy, Barbie-like figures—big on the top and bottom with a tight little midsection. Discover effortless carving performance with the roll of your ankles and the twitch of a smile with these skis. Their superhero functionality increases with edge-angle, allowing the pressure to build. Controlling and playing with this energy allows you to keep it on the snow, zip into the next turn or fly off the next roller. Ski Canada testers pay detailed attention to how skis in this category initiate a turn, grip and hold their edge, and how the energy (pressure) of the ski is released into the next turn. Great cruisers need to be responsive and lively in a variety of terrain. They are expected to shine on hardpack, and we run them through their paces to discover their versatility. The category has no speed limit (just caution signs, patrollers and the Responsibility Code). With their bellies ranging from 67-83mm, the 2015 lineup is a good one. MEN: G-Power—you’ll want to ski it and experience it every single day. This ski was fun, and the test cards speak for themselves. Kristian Armstrong wrote: “Lots of power and fun in one great package. It rips, plain and simple.” Erin Keam stated: “Sit down, shut up and put this ski on edge. Rip corduroy to shreds. Stable beyond belief.” And Paul Cunnius added: “This ski delivers more power than the effort put into each turn.” The ski was designed for carving hardpack and built using traditional high-performance technology. All our male testers enjoyed this grippy, stable and playful ski. WOMEN: Have you ever had that dream where you tip your skis on edge and then keep on tipping them to achieve an incredible edge angle in a pure carved turn? Well, dream no more! As Donie Blunden found: “Roll this ski over, giddyup and go with your fun meter on high!” An advanced skier who wants to work a carving ski will really enjoy the fun and sporty ride of the women-specific Insomnia Fusion. Heather Robilliard enjoyed her run: “It’s a solid ski with a dampened feel to it, and it hugs the ground.” Did someone say Porsche technology? MEN & WOMEN: A ski with a big sweet spot and a predictable attitude will deliver a standing ovation on rock-hard eastern man-made or dig deep trenches in the coastal mountains. And you’ll find high-speed stability and consistent performance, just as John Storey did on this ski, loving its “big arcing turns.” Advanced to experts looking for a stable ride will not be let down. The women agreed the RC4 is a take-charge ski best suited for the heavier expert with an aggressive attitude. Anne Terwiel found it a “full-on carver to rock your world without rocking you off balance.” Not for the weak, timid and shy—playful divas only. MEN: Head has created a performance ski for the advancing skier. The iSupershape Rally is a stable, powerful tank that would be an ideal weapon for the technical skier on steep, groomed cruisers. 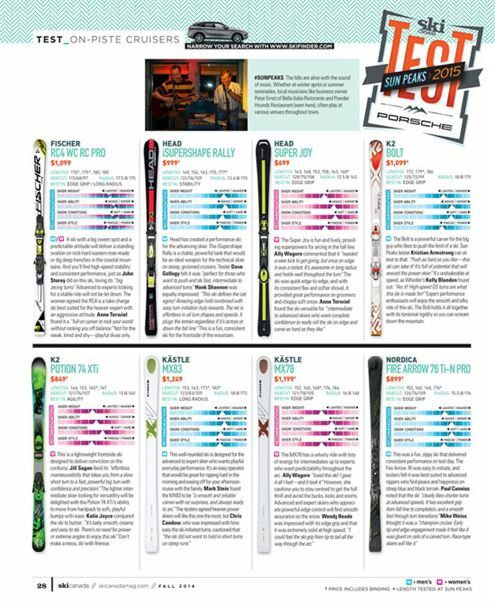 Tester Dave Gollogy felt it was “perfect for those who want to push and ski fast, intermediate to advanced turns.” Hank Shannon was equally impressed: “This ski defines the category! Amazing edge hold combined with easy turn initiation truly rewards. The ski is effortless in all turn shapes and speeds. It plugs the terrain regardless if it’s across or down the fall line.” This is a fun, consistent ski for the frontside of the mountain. MEN: The Bolt is a powerful carver for the big guy who likes to push the limit of a ski. Sun Peaks tester Kristian Armstrong can attest to that: “Push as hard as you like—this ski can take it! It’s full of potential that will reward the power skier.” It’s unshakeable at speed, as Whistler’s Kelly Blunden found out: “Arc it! High-speed GS turns are what this ski is made for!” Expert performance enthusiasts will enjoy the smooth and silky ride of this ski. The Bolt holds it all together with its torsional rigidity so you can scream down the mountain. WOMEN: This is a lightweight frontside ski designed to deliver conviction on the corduroy. Jill Sagan liked its “effortless manoeuvrability that takes you from a slow short turn to a fast, powerful big turn with confidence and precision.” The lighter intermediate skier looking for versatility will be delighted with the Potion 74 XTi’s ability to move from hardpack to soft, playful bumps with ease. Katie Joyce compared the ski to butter: “It’s baby smooth, creamy and easy to ski. There’s no need for power or extreme angles to enjoy this ski.” Don’t make a mess, ski with finesse. WOMEN: Get primed for a huge dose of fun with the Bamboo, a light, versatile ski that likes to play chameleon. 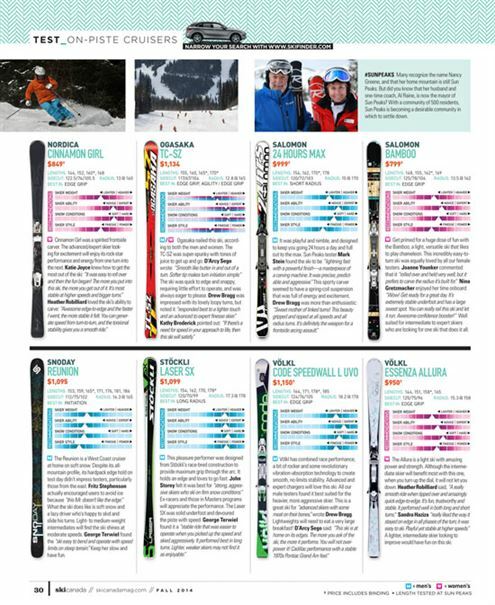 This incredibly easy-to-turn ski was equally loved by all our female testers. Joanne Younker commented that it “rolled over and held very well, but it prefers to carve the radius it’s built for.” Nina Gretzmacher enjoyed her time onboard: “Wow! Get ready for a great day. It’s extremely stable underfoot and has a large sweet spot. You can really rail this ski and let it run. 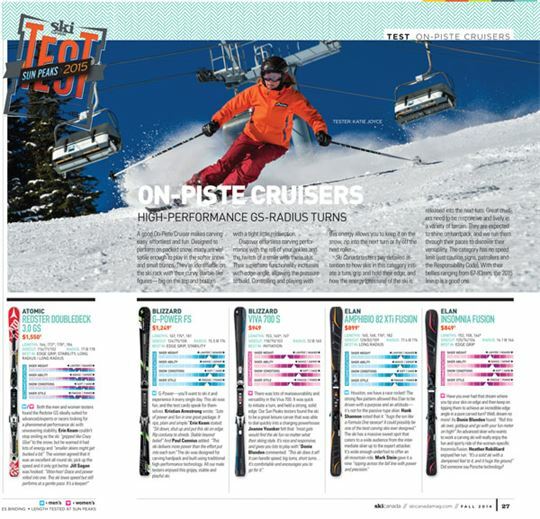 Awesome confidence booster!” Well suited for intermediate to expert skiers who are looking for one ski that does it all. MEN: The Reunion is a West Coast cruiser at home on soft snow. Despite its all-mountain profile, its hardpack edge hold on test day didn’t impress testers, particularly those from the east. Fritz Stephenson actually encouraged users to avoid ice because “this Mr. doesn’t like the edge.” What the ski does like is soft snow and a lazy driver who’s happy to skid and slide his turns. Light- to medium-weight intermediates will find the ski shines at moderate speeds. George Terwiel found the “ski easy to bend and operate with speed limits on steep terrain.” Keep her slow and have fun. WOMEN:The Allura is a light ski with amazing power and strength. Although the intermediate skier will benefit most with this one, when you turn up the dial, it will not let you down. Heather Robilliard said, “A really smooth ride when tipped over and amazingly quick edge-to-edge. It’s fun, trustworthy and stable. It performed well in both long and short turns.” Sandra Haziza “really liked the way it stayed on edge in all phases of the turn; it was easy to ski. Playful yet stable at higher speeds.” A lighter, intermediate skier looking to improve would have fun on this ski.